Faculty for Mount Royal Jazz Diploma Program. Private teacher and head of MRC Guitar Workshop. Fate took Ralf touring the country with country acts for 3 years following college where he found a home in Calgary, Alberta. In 1998 Ralf became an alumni of the Banff Center For The Arts Jazz Workshop as well as a faculty member of Mount Royal University’s Jazz Diploma program(a position he currently maintains). He is currently co-leader of the Contemporary-jazz quartet Terrain, co-leader of the Bebop-jazz ensemble Manic Thematic Trio and a popular choice as free-lance guitarist for live engagements, recordings and as a composer-for-hire. In 2004 Ralf won the TD Canada Trust Jazz Festival Writers Commision Award and his collaborative effort with Richie Pollack ‘Stew’ earned them a WCMA nomination. Ralf’s 2007 release EST 1968, his first CD under his own name, was awarded #3 of CKUA Radios Top 100 of 2007 as well as a nomination for Best Instrumental Recording by the Hamilton Music Awards and a review in Guitar Player Magazine. 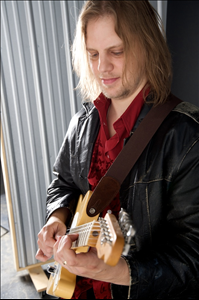 2009 ‘s RENEWAL, earned nominations for Best Guitarist, Best Instrumental Recording and Best Blues Recording by the Hamilton music Awards as well as a review in Blues Review Magazine. In 2010 Ralf was honoured to be invited to play for the Olympic festivities in Vancouver with his EST 1968 band. Ralf is married to noted singer/song-writer/pianist Corinne Plomish and a proud father of 2 children and 3 dogs.